After 3 months of working on it, we put our first flipped house on the market in mid-March and went under contract shortly afterward. Closing is around the corner, but I’m superstitious so won’t be sharing any of the financial details until the money is in the bank. But, stay tuned and keep your fingers crossed for us that the closing goes smoothly! In the meantime, I’ve finally gotten around to organizing the 100s of photos I have of our fist flip project. While John did the lion’s share of the labor on this project, I made every single decision around finishes and look. There were definitely some hiccups (mental note: white penny tile + white grout = blech), but all-in-all I think it came together nicely. For all of you out there who thinks it sounds like fun to choose the finishes, it is…but it’s also very stressful (especially when your boyfriend/business partner is impatient with how much time you are taking to look at tile!). It’s one thing to choose a tile you like. It’s a completely different story when you have to think through whether that tile will look good with the vanity you are choosing, and whether that vanity will go with the paint color you were thinking, and whether that paint color will be too matchy-matchy with the vanity top, and on and on down the rabbit hole. And, on top of it all, you need to make sure you are getting a good deal on every single item because at the end of the day this is all about money. It’s enough to make you go crazy, but at least you’ll have fun on your descent to insanity. Anyway, I hope that the following photos attest to the blood (mainly John’s), sweat, and tears (mainly mine) we put into this project. It’s hard to see from the photo, but we replaced the lighter-colored laminate flooring with a dark coffee-colored engineered hardwood. It looks black in the photo, but it’s really a dark, rich brown. I felt very strongly that we needed to stage the smallest rooms in the house when we put it on the market. Mainly because the house is teency and empty rooms seem smaller than they really are. 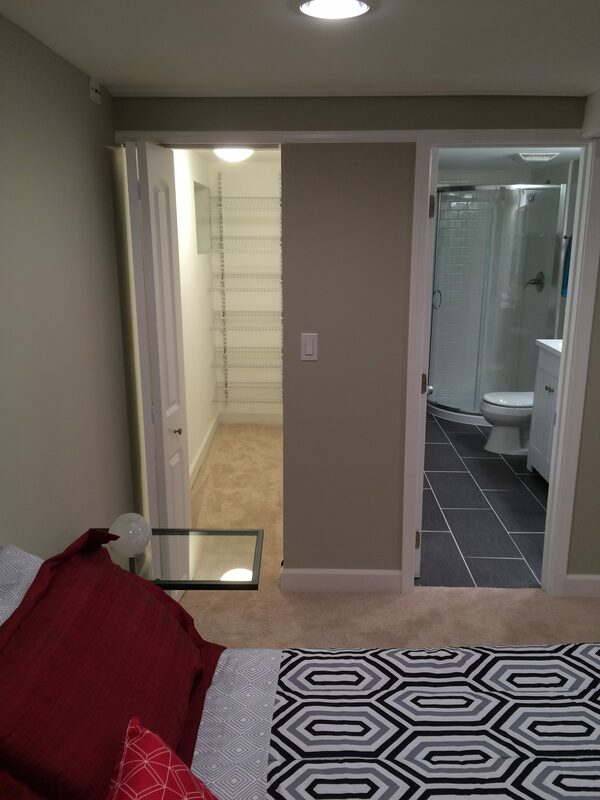 I wanted to let prospective buyers see the potential of the small living room and smaller bedrooms. And rather than spend $1500+ on a stager, I decided to stage it myself. I planned to spend no more than $1500 and to re-use the furniture for the next house. I did all of my shopping at Walmart, IKEA, Home Goods, and Goodwill. I bought the two armchairs I put in the living room (you can see one of them in this photo) for $7 each from Goodwill. They were stained and an army green color. I planned to put Pinterest to work and re-upholster them. In the end, I decided to paint (yes, paint!) them a dark gray. It was a lot of work (shout out to my mom and my friend, Chrissy, for helping), and they are not the softest chairs you will ever sit on, but they get the job done and most people have said that they would have never guessed. So, mission accomplished (and nah-nah-nah-nah-boo-boo to all those naysayers out there…you know who you are)! The biggest compliments I got were from a realtor who called asked who our stager was and said that it was some of the best staging she’s seen and another was from a college-aged girl who came in with her parents for the open house and asked if the furniture came with the house. Here are few more “after” photos to give you a sense of how we set up the space. Quite the transformation, right!?! We went back and forth on whether to replace the kitchen cabinets. From the photo you can’t see how dirty they were, but that could be easily rectified with a toothbrush and some elbow grease. But, all-in-all they were in pretty good shape and ultimately it would have cost us an extra $2000 or more to replace the cabinets, not to mention the added time. So, I busted out the rubber gloves, toothbrush, and Comet and I got to work. Every single groove was spotless when we put it on the market. We also changed out the hardware from chrome to brushed nickel. 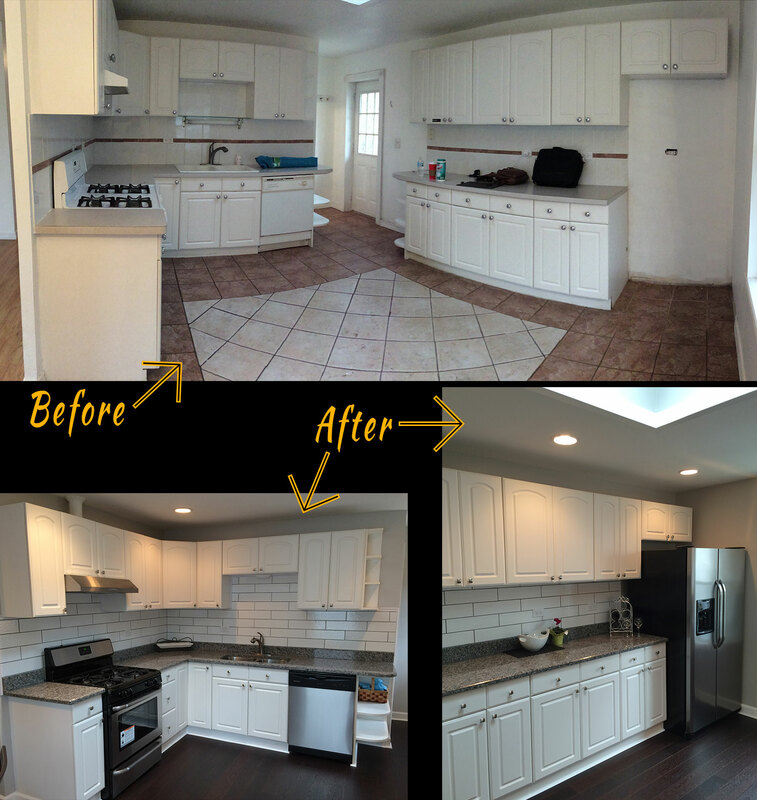 Add in the new granite counters, stainless steel appliances, and updated backsplash and the cabinets seemed brand new. What a world of difference! The basement was not finished when we bought the house. 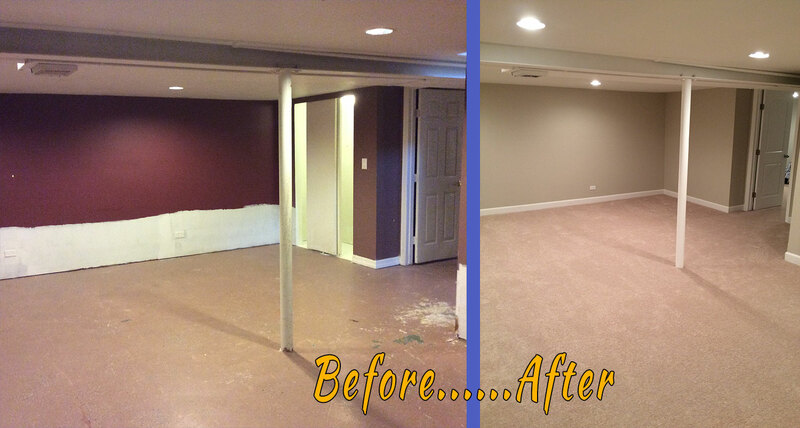 Finishing the basement doubled the livable square footage. The space was already split into two separate spaces and we kept it that way so that the larger area could be used as a family room and the other as a master suite. With the light colored carpeting, light walls, and white trim, the whole space is now so bright and welcoming, when it used to feel dark and scary. Creating a master suite in the basement makes the house much more practical for a family. Technically, because it doesn’t have a window large enough to escape from in an emergency, it can’t be considered an extra bedroom, but we set it up to be used that way. The buyers can do what they want with the space. The bedroom now has a his (standard) and hers (walk-in) closet. The walk-in closet was John’s brilliant idea. As you may remember the bathroom in the basement was ridiculously large (12′ x 8′, which is as big as some bedrooms) and had almost nothing in it – one pedestal (!?!) sink, a toilet, a small corner shower, and for some reason a very large closet with double bi-fold doors. We basically left the closet where it was, but turned it around so that the entrance to the closet was one small bi-fold door off of the bedroom, creating a long, one-sided walk-in closet. There was a lot of floor space in the master bathroom. Too much. 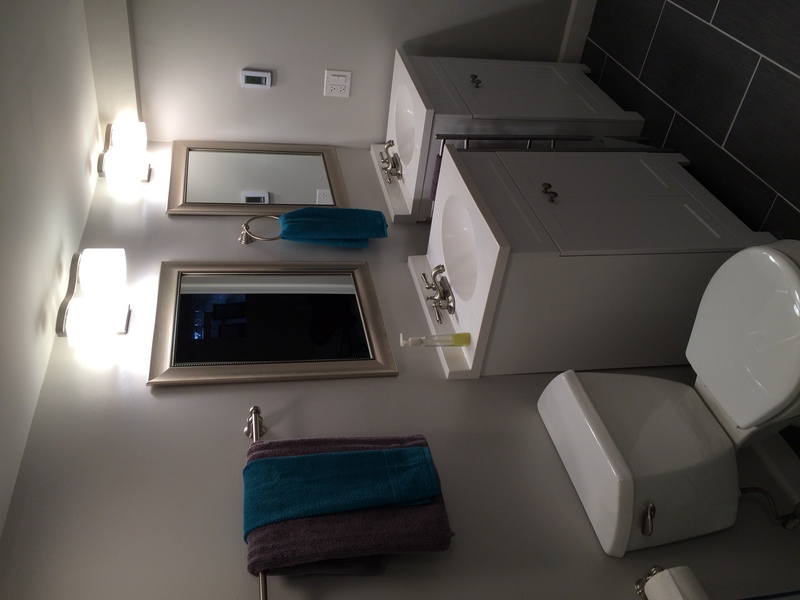 So, we did a double vanity (well, more accurately, we did two single vanities), put in a new corner shower (tiled with subway tile), and added a little make-up station. The other thing that really added value was to add heated floors under the tile. We wanted to give the family that bought this house a little bit of luxury. 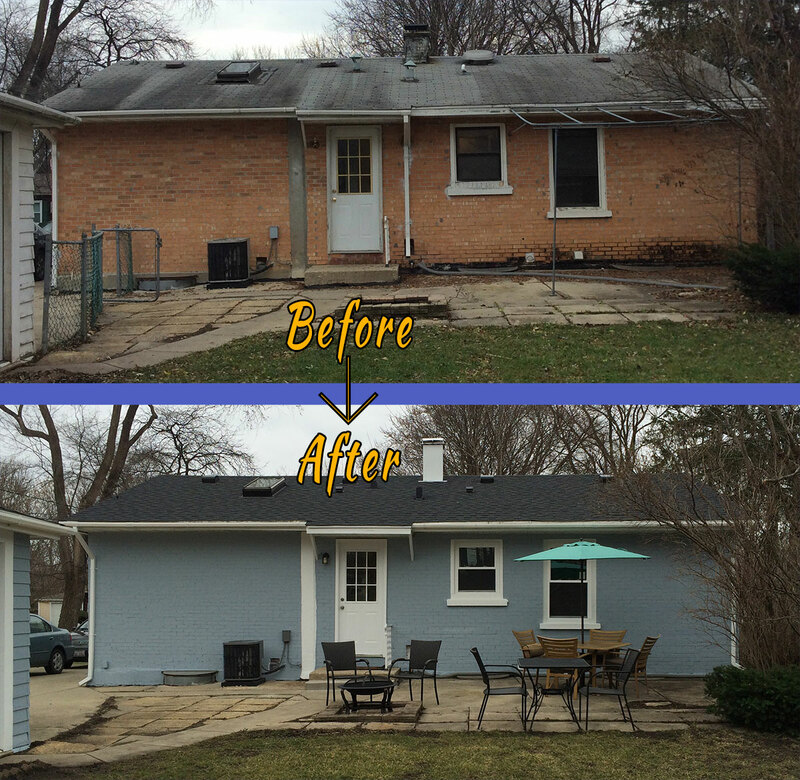 We originally wanted to rip out some of the back concrete or add a very low deck, but it was cost-prohibitive. Instead, we just cleaned it up a bit and ripped out the fencing that was on the side. The new roof, house color, windows, door, and gutters make it look so much better. I hope you enjoyed seeing the fruits of our labor. I’m pretty proud of what we did and I’m looking forward to moving on to the next project, about which I will hopefully share details soon. You guys did an amazing job! Can’t wait to see and read about your next flip! Kudos to both of you!! !